If you remember, on Saturday we attended an SCA event called Twelfth Night, as vendors. 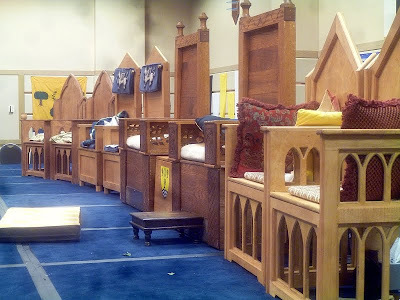 The SCA is a Medieval living history organization with chapters all over the place. It is dedicated to re-creating the best parts of the Middle Ages and discovering the chivalry in everyone. Collectively, members of the SCA have done more historical research than any other organization on the planet. Don manned the cart on Friday and Sunday; the girls and I went on Saturday. Sadly, sales were abysmal, but it was so much fun to be at an SCA event again! We used to be active before the kids were born, but between babies, livestock, and a remote farm (i.e., far away from most large events), it got too much and we dropped out. But with this event held practically in our back yard, we went and had a blast. Our cart ended up in the hallway outside the Merchant's Room because we applied too late to be fitted into the room. However this turned into a blessing in disguise, because we were just across from the open double doors of the ballroom of the hotel, where Court was being held. The hotel staff had set out chairs for 600, although only about half those were filled during Court. I don't know whose coronet this was, but I thought it was very pretty. And very Northwest. There was a charity auction held before Court (with proceeds going to the Juvenile Diabetes Research Foundation), to which we donated a tankard. It was auctioned off for the astonishingly high price of... $105!! This was the last Court of the outgoing King and Queen. ...including this Princess with her amazingly well-behaved baby. A second Court was held later in the evening, during which the incoming King and Queen were crowned. Our girls had never attended an SCA event before (unless you count a local event we went to when Older Daughter was a baby) and they loved it. I thought they'd be bored, but they were NOT. They wandered through the hotel all day, marveling at the pageantry and the costumes... but most of all at the manners. Men and women alike were chivalrous and kind. In the SCA, this is very ordinary. But in the "mundane" world (as it's known), such manners are uncommon. The girls found it wonderful. They got their share of attention, too. Younger Daughter wanted to purchase a decorative dagger from a vendor in the Merchant's Room. The vendor needed my permission (since Younger Daughter is a minor) so I went around the corner and introduced myself. This gentleman was 88 years old and looked 60 (no exaggeration), and he immediately seized my hand and kissed it, complimenting me on rearing such well-behaved and polite daughters. He wanted to hire both girls on the spot to work his booth! Later in the evening, the back end of the ballroom was cleared out and a Queen's Rapier Tournament was held. The hotel grounds were still lit with Christmas lights. Despite the bad sales, the girls are begging to attend more events. It's all going to have to depend on distance, of course. A farm anchors us down and one adult will always have to stay home. But perhaps we can start attending some of the larger events if they're not too far away. It sure was nice being back in the SCA! Great pictures, looks like you all had fun! Hope you get to attend more. Take in a war event. Maybe hard for you guys to to be gone that long but more days of sales, real fighters instead of wire-weenies and much better immersion. I always have been more fond of the earlier period stuff though. That looks like great fun! My folks used to take me to scifi conventions when I was a wee one. Love the job Don did on the cart! I should add that the eight-eight year old man was still teaching martial arts. Love SCA events! I've been to about three in the past year and a half. My sis and I even managed to throw together costumes so we could blend in. Our first event was rather small because many of the people decided to wait for one of the big wars that was supposed to start the next week, but it was still so much fun. It took place in the barony of Beornsburg in Ansteorra near the San Antonio area in Texas (sadly The Steppes where my sis and I are located in Dallas has very little activity). It was called the Judgement of Paris, and we had a blast. My sis got to participate in the presentation of gifts to the Baron and Baroness and did a commission piece for the man who introduced us to this society (she got to walk up with him dressed in a pirate outfit). They were thoroughly impressed. There were also three women playing the goddesses and a blind prophet going around poking fun at everyone. One time one of the younger participants did something to the prophet (probably taunted him too much), and he went over to our guy (the one who took us there) and told him he was going to defeat the Hungarian (the young guy's nickname). Sure enough, during their next match, the kid made a mistake that left him open for the other guy to literally launch him into the air with his shield! Nobody got a video of it, but someone did manage to take a picture just as it happened. They also had a "Tavern" set up at the pavilion, complete with a neat little backdrop where the counter was and a wonderful paper tapestry chronicling the history of the Barony (they modeled themselves after the Norse, so the tapestry reflected that). One of the old guys that had been there since the beginning told us about what all the pictures meant, including the one where they built make-shift villages for a battle and they took the wrong turn down the "river" and burned and looted the wrong one. At the end they had a HUGE feast, multi-course, representing the goddesses. There was so much food because they were expecting more people, and they were begging everybody to take home! They held court in this lovely little outdoor stage at the bottom of a nice grassy hill that was shaped a lot like an amphitheater. It was so beautiful out there. You could see the stars so well in our camp. The thing that did strike me as oddly pleasant was the manners these people had. We met the man who took us there at a convention for anime/gaming/sci-fi/fantasy. He was there to recruit members in his full armor, a very big guy but the sweetest person you will ever meet and practiced chivalry in everything he did, and he always looked out for us. I hope your girls get a chance to go to more events. There's so much they could learn from these people. The only thing we've done is Medieval Times Dinner and Show. You pay beaucoup bucks and get to sit in your color coordinated section to scream for you knight in same colors on horseback to win the jousting match. There's a show, too! You eat all your chicken dinner without silverware just like they did in Medieval Times. It's a blast! Here in the PRK, the SCA bills itself as "The Middle Ages as they were and as they might have been". The manners may be there, but they have decided to focus on the Occult (which was present in the Middle Ages but wasn't the focus of most people at the time), and there is a HUGE immorality problem. Your daughters probably would not be safe at an event here. We stopped going because, as Bible-believing Christians, we were APPALLED at what went on there. Hopefully, in a more sane area, your SCA will not degenerate into this. The big Renaissance Faires here suffer from the same disease. I dislike the fringe occult influence too, but I believe it IS fringe, not mainstream SCA. Regardless, we'll be lucky to attend one or two events a year, and our girls will always be with us, so I'm not too worried. Why Oh why don't we have events and organisations like this in the UK? I just know I would fit in as I'm constantly told I was born in the wrong century (I think they mean it as an insult, I take it as a complement. Although insinuating I'm so old fashioned I was born in the wrong eon is pushing it a bit). I even have my own sabre (I never understood the fascination with those wussy epees and foils myself). If I may be so bold, I suggest you make a larger version of your beautiful tankards. Why? Because to do the medieval events justice you must quaff not sip (I'm given to understand this means spilling >60% over yourself whilst singing raucous songs and waving your claymore about - It sounds fun!) and it will take at least a quart before my singing can even be approximated to being good enough to call raucous. Actually, you DO have the SCA in the UK. You are in the Principality of Insulae Draconis, within the Kingdom of Drachenwald and you would be most welcome to join us. And a number of our events are in real castles! There's a lot of crossover between science fiction fandom and SCA-I've met plenty of SCA folks at cons-most are very well versed in history,as well as a variety of crafts from leatherworking to smithing. I used to save empty freon jugs for a guy I knew who was in the SCA-they were turned into helmets. I've not noticed much occult influence, other than possibly from a historical perspective-that is, a knowledge of what religions were prevalent at the time, customs, traditions, celebrstions and so on. I am so. Friggin'. Jealous. I'm originally from Coeur d'Alene, and I've been in the SCA for over a decade. When I heard you were going to this event, in my hometown, I almost booked a train ticket to the event. Granted, I would have been in much trouble from Uncle Sam, but it could have been worth it. Most Kingdoms have a mainstream historically minded and based leadership which supplies the various officers (Kingdom and local group) peers and royalty. Typically you have some turnover because financial circumstances can reduce travel and therefore limit someones ability to become Royalty or take on a Kingdom office. Also constant travel to stay on top of your game if you are of the combatant type and therefore royalty bound can burn you out fast. About a decade ago one of the Society Marshals ran the numbers and found that the average life span of an armored fighter was three years. As a Kingdom Earl Marshal myself I found that on average most of the fighters stop renewing after about 3 to 5 years as well. The large events draw in the fringe groups. Pennsic has a huge sub-culture with any flavor of fantasy/horror/heathen mock slavery you name it groups settled mostly around Coopers lake. There is of course the TOR wannabes or Tuchuks out on the hill as well. On the plus side I have seen some amazing attempts at factual historical groups that turn any fringe unsightliness into a mere annoyance. Some groups (I won't name them) recreate gorgeous Celtic, Nordic, and other cultural tribal life. Others go the Christian route with amazing accuracy and zeal. If you have the finances and the time/ability to travel I highly recommend the lifestyle but it will cost you in both time and money. Oh, please....keep Europe in Europe. Kings and Queens? Knights? Egads, give me a break. I'm gonna hurl. And Boxing Day is British, not American - let's keep it that way. Anonymous Patroit... At its core the SCA is a game. Yes, the SCA has "titles", but those are earned within the society only. People can't just come in, put on a suit of armor, and declare themselves a knight anymore than wearing a black belt makes a person a Black Belt in Karate. The SCA worldwide is known for advancing knowledge of history, of research, but also in learning history with a "How would it really have been done?" It's one thing to watch people swinging swords at each other, but how was combat *really* handled was a big question. So they put on armor and used sticks (weighted like swords) to find out. Yes, folk in the SCA are as loyal to their Kingdom, or Barony, or regional area as much as any Football fan is loyal to their team. But that Loyalty does NOT supersede loyalty to our home country. I may live, and fight, and cheer for my kingdom, Caid, but I am as American as you are. We all live within our respective countries and nobody in the SCA would ever suggest replacing our Constitution, elections, or politicians with the SCA way. Do you really want our President election to be decided with trial by combat? It is truly a sad state of affairs when one has to attack what one does not know or understand. I have been playing our game for about 7 years now and have learned to enjoy so many different ideas and people. I reside in Canada but have had the pleasure of attending events with people from the US and Europe and have found them mostly entertaining and well versed individuals and groups. When I was first introduced to the SCA I was a little sceptical as well, dressing up and hitting each other with sticks, wierd. But, remaining open minded I started to attend local events and was very welcomed. Before judging any group or interest. Try it out you might be pleasently surprised on what you can learn and what kind of nice patriotic people you can make friends with. Love this and bet it was very fun! Anonymous Patriot - All the titles are earned, not given. Kings in the SCA don't get to be king by having a watery tart toss a sword at them, they have to fight for it. The various titles are earned by service, not by just having them handed down. Besides, where else in America can you build a suit of armor, and then get dressed in it and start hitting people? The circlet is Shadra's laurel circlet. Whoever crafted it, did a wonderful job. Welcome back! I hope to see the cart again and hopefully I'll have need to buy someone one of those beautiful mugs! Thank you, Dearbhail! We're keeping an eye on the Caidian calendar in hopes of finding another event close enough to attend. I just want to tell you that I’m beginner to blogging and site-building and really liked this web site. I want to bookmark your website. I thought they'd be bored, but they were NOT.